Welcome to the AALEP website. While maintaining the acronym and the AALEP brand, which is well-known, AALEP now refers to the Association of Accredited Public Policy Advocates to the European Union. We represent Public Policy Advocates who are duly accredited to the European institutions. Our mission is to enhance the development of professionalism, competence and high ethical standards for Public Policy Advocates working in the public policy arena, primarily at the European level. As professional Public Policy Advocates , we perform an important service not only to the organisations we work for and the clients we represent, but also to the public at large, in an ethical manner. AALEP members adhere to a stringent Code of Ethics that focuses on promoting the highest level of ethical public policy advocacy. Established in 2005 as a non-profit international association (Association Internationale Sans But Lucratif) under Belgian Law, we work to educate people on the public policy advocacy process, and why EU citizens should be advocates at some level. The EU institutional structure and decision-making process is complex, which makes it difficult for decision-makers to clearly see an issue from all perspectives and to identify the best course of action. Public Policy Advocates serve as educators and information providers to help elected and appointed public officials make informed and logical decisions. Public Policy Advocates represent every walk of life in an effort to make sure their voices and issues are heard by decision makers. AALEP believes that through transparency, continued ethical representation and a strong educational campaign, we will help EU citizens understand the critical roles that Public Policy Advocates play in our society. AALEP has elaborated an Executive Public Policy Advocacy Certificate Program in order to help those of all skill levels improve their knowledge of the EU decision-making process and the public policy advocacy profession. AALEP Membership and Services Division (AMSD) manages services and benefits for the members, is responsible for responding to all membership-related inquiries, processes all member applications, maintains the membership database to reflect active and inactive memberships, process payments of dues, edit changes in membership status, and so forth. Membership Development is primarily responsible for the recruitment of new members, creating awareness of new business trends and development; fostering camaraderie among members and conducting all other undertakings that cater to members' needs to ensure more active member participation and involvement. AALEP Consultancy Services Division (ACSD) offers advocacy and European affairs services on a consultancy basis. AALEP helps clients navigate the Brussels bubble, build relevant relationships with EU institutions and stakeholders, raise awareness and increase clients' advocacy impact as well as develop their expertise and knowledge. AALEP is able to offer strategic advice, training communications and event support. In addition to this, through our members we can offer specific activities in the policy areas and themes of interest to clients. AALEP Academy of Public Policy Advocacy (APPA) provides professional development learning opportunities and mentoring/coaching designed to enhance the in-house capacity of companies, trade and professional associations to constructively and effectively influence decisions of government. The goal is to develop a body of learning tools of braod relevance for use by individuals and organizations whose objectives include legitimately influencing public opinion, institutional behaviour and public policy. APPA offers an Executive Certificate in Public Policy Advocacy, covering 5 modules that extends over a six-month period for a total of 144 hours. AALEP Strategic Alliances and Partnerships Division (SAPD). The mission of SAPD is to align AALEP in unique and rewarding partnerships with country and/or regional associations of public affairs, communications consultants, lobbyists sharing the vision and goals of AALEP. AALEP has already concluded a number of protocols of co-operation with many associations throughout the world. There are many benefits to be accrued from such co-operative arrangements, because by combining our respective strengths with others (resources, capabilities, core competence) we're in a better position to achieve compatible objectives while both sides retain their individual identities and share in the risks and rewards. Christian D. de Fouloy is a multicultural and multilingual French-American expert in public policy advocacy, lobbying, public affairs and government relations. A Brussels-based resident since 1999, he's the Founder and Chairman of the Association of Accredited Public Policy Advocates to the European Union (AALEP), a platform for representation, networking, education, ethics and cooperation for professional public policy advocacy practitioners. He's also Managing Director of BAI-Business Advisors International Limited, an international consultancy offering a comprehensive and personalized range of government relations services to European, foreign organizations and governments. He is also the co-founder of GlobalGovAffairs.com, a new and unique website that serves as a central global best practice platform for the Global 500 corporations' public policy engagement throughout the world. Prior to moving to Belgium in 1995, Christian D. de Fouloy served as Senior Associate on the team of technical experts of the Washington World Group (WWG), a Washington-based firm engaged in lobbying activities on behalf of foreign nations to better inform Congress, the White House, Executive Departments and the American public of events and issues that affect foreign relations. Due to his extensive background and numerous connections in business, political, academic and non-profit sectors, Mr. de Fouloy served as a link for WWG to the European Union. Back in 1991, he was Founder and Secretary General of the European International Consultants Organization (EICO), a Geneba-based non-profit association created for the purpose of bringing highly qualified international consultants and advisors in diverse disciplines and improving the quality and efficiency of their services to governmental, non-governmental and multinational enterprises. 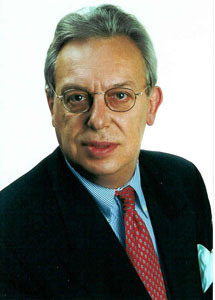 In 1988, he was appointed as Secretary General of the International Committee Against Counterfeiting (COLC) headed by the former President of the Swiss Confederation to fight on an international level against all attacks on intellectual property rights, namely counterfeiting and unfair competition as well as influence international, intergovernmental or supranational organizations as well as government leaders on the need for increased protection and law enforcement. Christian D. de Fouloy is an expert on lobbying laws and has been retained by governments for the development of conceptual legal framework for lobbying and advocacy activities. Christian D. de Fouloy has authored 12 books on political and economic issues and his latest work is the 'FOULOY's EXPLANATORY LOBBYING DICTIONARY' a single one-stop resource on the meanings and underlying concepts, processes and techniques used in lobbying, public affairs and government relations. Christian D. de Fouloy is a frequent guest speaker on government relations topics (seminars, workshops, roundtables) throughout the world. Strenthening the capacity of civil society organizations by providing CSOs with information and expertise and tailored training programmes for individual and organizational development of advocacy competencies. Assisting civil society organizations in contributing to governmental anti-corruption efforts. Seminar organized by the Technical Assistance Information Exchange Instrument of the European Commission with the Montenegrin Ministry of Justice, Directorate for Anti-corruption initiative on the subject of ‘Prevention of Corruption: Implementation of Integrity Plans’ Designated EU Expert on Panel IV: Legal frameworks of lobbying and raising the level of integrity of the institution. Topic ‘Ways of implementing clean lobbying practices’. Seminar organized by the Foreign Trade Chamber of Bosnia & Herzegovina’s Institute of Education on the subject of ‘Perception of Lobbying into business, public and construction sector- experiences of the countries in the region, in Sarajevo, Bosnia and Herzegovina ( Guest speaker along with the President of the Croatian Lobbyists Association, Association of Lobbyists in Montenegro, President of the Assembly of the Association of Lobbyists in Serbia and Head of the Macedonian Center for Lobbying). Guest Speaker at the Public Affairs Community of Europe (P.A.C.E.) annual meeting in Paris, France. Topic: ‘ Expanding the practice of lobbying to public policy advocacy’. Participation in a two-day conference in Sofia, Bulgaria on the ‘Roles of Lobbyists’. The event aimed at members of the National Assembly of the Republic of Bulgaria, facilitated by the Economic Policy Institute in Bulgaria with funding from U.S. Embassy. The purpose of the conference was to engage with members of the National Assembly and their staff about the lobbying practices, and regulations in the United States and throughout the European Union as the National Assembly was deliberating on the extent to which Bulgaria should develop lobbying laws and codes of ethics. Presentation of lobbying concept, methods and tools to the School of Public Administration in Riga, Latvia. Frequent lecturers and guest speakers on lobbying and corporate public affairs ( European Centre for Public Affairs (ECPA), Brussels, Belgium; European Institute for Public Affairs and Lobbying (EIPAL), Brussels, Belgium; AdEU-Advocacy Europe (ADEU), Brussels, Belgium; Institut des Hautes Etudes en Communications Sociales (IHECS), Brussels, Belgium; United Business Institute (UBI), Brussels, Belgium; Hawksmere seminars on lobbying and decision-making in Europe, Brussels, Belgium; EU Conferences Ltd, Brussels, Belgium; Université Catholique de Lille (UCL), Lille, Frnce; Institut Supérieur Européen du Lobbying (ISEL), Paris, France; International School of Management (ISM), Paris, France; Institut Européen de Management International (IEMI), Paris, France; Ecole Nationale d’Administration (ENA), Strasbourg, France; Université de Strasbourg, Strasbourg, France; Groupe ESC Toulouse, France; Seminar organized by Omniconsul in Lisbon, Portugal with the presence of EU Commissioner Siim Kallas, Management Training Center, Riyadh, Saudi Arabia; American League of Lobbyists (ALL), in Washington DC., USA. Appointed by the Government of Latvia (Anti-Corruption Bureau) as Expert for the development of a conceptual framework for lobbying activities under a World Bank financed programme. Engineered the first MBA Programme in Business Lobbying and EU/U.S. interest representation in Brussels for the United Business Institute in Brussels, Belgium. Created the AALEP Executive Certificate in Public Policy Advocacy (delivered on location). This in-depth programme covers 5 modules and extends over a six-month period representing a total of 144 hours. Module 1 (Principles of policy influencing and public policy advocacy; Mapping the public policy advocacy landscape; Issues and stakeholder management in public policy advocacy; Public policy advocacy in practice: Tools and Tactics). Module 2 (Developing a public policy advocacy strategy; Designing and planning public policy advocacy campaigns; Handling the media in public policy advocacy campaigns; Public policy advocacy on-line). Module 3 (Positioning; Measuring results; Campaign finances; Persuasion). Module 4 (Practicalities of public policy advocacy in different contexts and countries; Policy advocacy dynamics and relationships). Module 5 (Coalition/Alliance Building; Working with public policy advocacy consultancies).